Our Teardrop style is made with smooth, soft lines to enhance the ambience of any room. 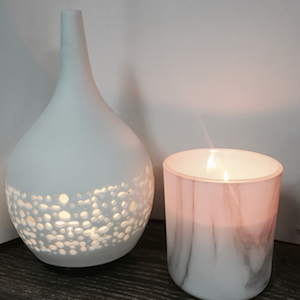 Our Ultrasonic Diffuser product range from Inspired Living is a stylish way to bring the benefits of aromatherapy into your home or workplace. Our exclusive designs are second to none, and offer a stylish way to bring luxury, sophistication and health benefits to any environment. 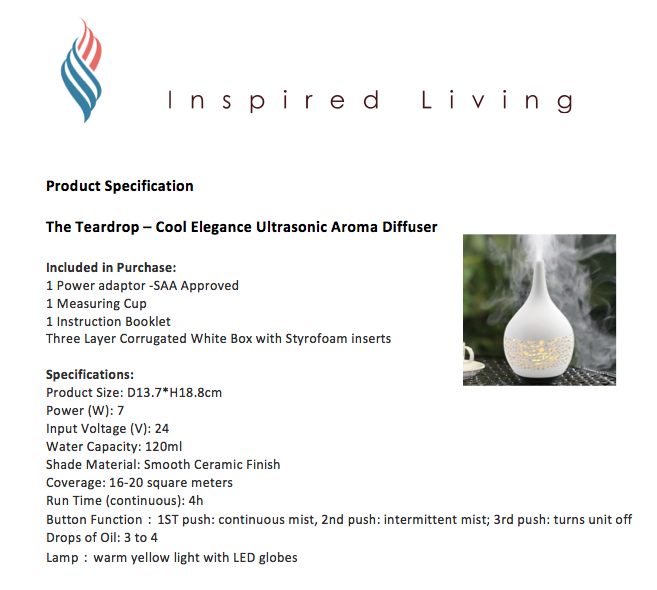 Our system combines the latest in diffuser technology with a variety of useful features. 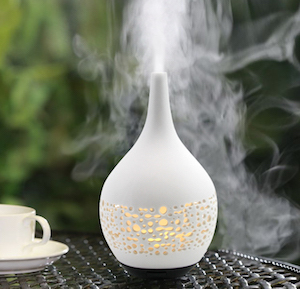 • The ultra quiet diffusing motion creates a peaceful and soothing environment wherever you need it most. • The Ultrasonic mist gives any space a spa-like atmosphere with therapeutic health and healing benefits when using pure essential oils. • Humidifier - Cold, dry air saps moisture from your skin, which causes all kinds of problems, including dryness, dullness, flaking, and accelerated aging. A humidifier can help prevent these damaging effects, and help you maintain a glowing and vibrant look. • Cleanse & Purify the Air – Diffusing pure essential oils in your environment can lower the count of airborne germs & bacteria, creating a more harmonious environment especially for those with highly sensitive allergies. Just have to say I loved the class I really enjoyed it was amazing I have learnt so much and feel 10 times more confident about selling candles, I think it has to be the best money spent to enhance my skills! I just wanted to thank Lea again for Saturday's class - I thought it was fantastic! I attended the soy candle making course on Saturday 5/5/17 & loved it. I did the soy candle making workshop today with Pam. The venue was lovely to work in. I really enjoyed it and Pam did a fantastic job teaching, explaining and answering all our questions. I bought all products so i can get started with my new hobby! I looooooved it, I had so much fun, it was show and tell at my place this weekend my family and I are candle people. Cant wait to start making soy candles, will take up another class one day would love to work in a candle shop. Thanks again for a great morning. My girlfriend and I just did the Soy Candle Making course and it was fantastic. Really really happy that I have discovered candles making! Found its helping me to achieve a good work/life/creative balance...And I can’t speak highly enough of your business and customer service.